Take a look at this the next time you feel like people don’t care about nature. Here’s the local Athol Bird and Nature Club, in Athol, MA, at their meeting last night. More than 200 people turned out to a share a simple dinner (iceberg lettuce salad, bottled Italian dressing, lasagna home-cooked in aluminum pans, chicken breasts plumped with instant stuffing.) There was a silent auction table with items ranging from a bag of mini-Snickers bars to a home-made tray with a red-bird cardinal painted on it. Then came the highlight of the night, a slide show about black bears. 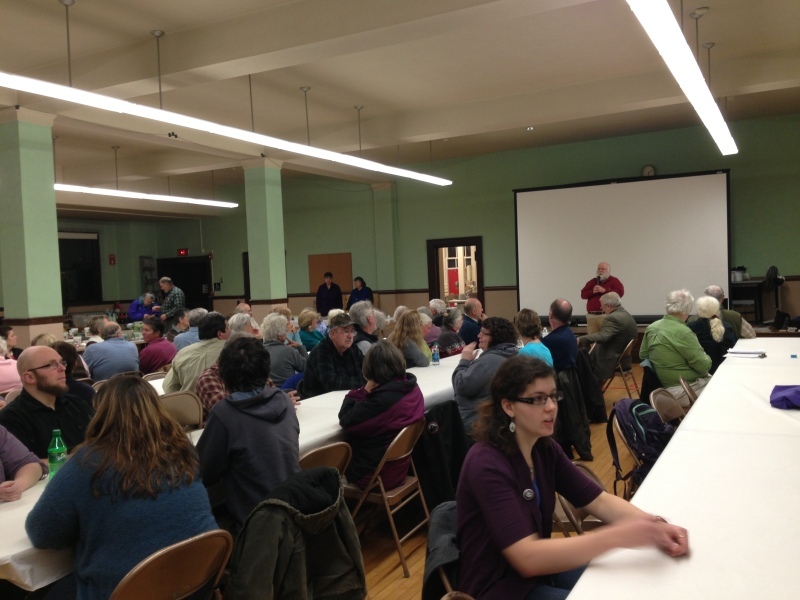 A big turnout at the Athol Bird and Nature Club. Standing is Dave Small, volunteer president for the past 25 years. Here’s what touched me. The turnout. Athol is a classic depressed New England mill town that last saw its best days economically long ago. A lot of people there live hard lives. And yet the Athol Bird and Nature Club thrives. Grandmothers, kids, parents, the Millennials we keep getting told only care about their electronic devices…they all turned out. And it’s not the first time. Back this fall, the club put on a day-long wild mushroom festival that had people spilling out of the building and onto the lawn, eager to identify the mushrooms gathered from the local woods and spread out on tables for all to see. That’s not all. The town also in December, 2013, completed an $8.6 million renovation and expansion of its 1918 Carnegie library. Its gracious spaces and soaring windows would be the envy of any town. According to the story in the Worcester Telegram and Gazette by reporter George Barnes, town voters approved the renovation in 2010, despite the worst economic downturn since the Great Depression, and before they knew they would get state funding to help. Last night was my first meeting with the club, which recently celebrated its 50th anniversary. I met the most wonderful people. As I stood in line for my lettuce and lasagna with chopped carrots and oddly white sauce ($10 donation per head) I asked the woman next to me in line what interested her, why was she here? I loved her answer: “I want to know what’s around me.” What better reason is there? People I talked to were into everything! Dragonflies. Moths. Geology. Stars. I took my paper plate to my table — you can picture the setting can’t you? Long folding tables end to end, metal folding chairs, fluorescent lighting, all in a basement function room at city hall. Seated next to me were four young women recently moved to small towns in the area, each doing public service with AmeriCorps, from helping teachers provide hands-on nature instruction, to working to help communities re-start local food supply systems. Each had uprooted themselves to move to small town New England for a year, and live on tiny wages out of an impulse to give big. When I left after two hours the club was still cranking. Dinner finished and slide show over, next to come was the q & a about black bears, and social time. Who knows how late they went! I walked out into a cold, starry night feeling wonderful about these people, their love of nature, and care for their place on our planet. Welcome to the North Quabbin Lynda. We are pleased you enjoyed your first ABNC meeting. Look forward to many more as the season progresses. wonderful story. Have you ever attended a “basement” function like this when you were not both moved and enlightened?